This year’s batch of Oscar nominated animated shorts are varied in both style and subject matter. They run the gauntlet of emotion from tortured to heartwarming to comedic, and the heart of each story is reflected in the animation. Each film succeeds in marrying the story to the art so that none of the films would feel right without their particular style of animation. Borrowed Time follows a sheriff as he reflects on a dark and brutal moment from his childhood. The minimal dialogue and bleak animation highlight the character’s inner turmoil. It’s a poignant piece that effectively utilizes the medium to explore the sadder side of human emotion. A sweet tale, but overall bland in style and substance, Pearl tells the story of a single father and his daughter as they navigate the ups and downs of life. A song about home connects the story, as the audience is shown vignettes from the small family’s life. The animation is simplistic in style, but it works for the narrative. Unfortunately, there isn’t much to set Pearl apart from other films. Blind Vaysha blends a unique story with gorgeous visuals. A faceless narrator tells the story of Vaysha, a girl born with one eye that can see the past and one that can see the future. Blinded to the present, Vaysha can see the beginning of creation and the destruction of the earth, or the beginning and end of the same day. The animation highlights the terror the future holds for Vaysha, as well as the staid limitations of the past. Blind Vaysha is a marvelous, even flawless film. Piper is also superb. The animation is stylized, but it offers hints of realism in the movements of the sand pipers as they dart back and forth across the sand dunes. 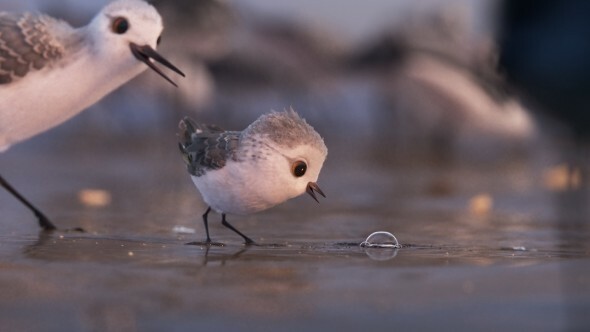 The story of a young sand piper that overcomes fear with the help of a friend is reminiscent of the most touching Pixar films. At times both comedic and heartwarming, Piper is a worthy addition to the Pixar line up. Techno Styles is the character at the center of Pear Cider and Cigarettes. With gritty graphics, Rob narrates the story of his friend Techno, a man seemingly larger-than-life. The imagery matches the story, from dull yellows to highlight Techno’s failing liver, to golden silhouettes to illustrate Techno as a mythic person. For a short film, Pear Cider and Cigarettes feels long, with moments of redundancy that slow the pace of an otherwise solid film.